Maybe you still remember the day the Population White paper was announced. But, even if you know nothing about Population White paper, we’re pretty sure you remember pushing your way through Lucky Plaza at Orchard Road on a Sunday afternoon, surrounded by foreigners or squeezing on a packed bus or a crowded MRT, filled with foreigners. We increasingly witness many instances of friction among the resident population (comprising of citizens and PRs) and non-citizens. Within just a span of a decade, there has been a visible spike in the increase of such occurrences. Singaporeans are feeling more like foreigners in their own country and in this article, we will analyse if this feeling is justified. By 2030, we will be looking at a ratio of 2.1 working adults to 1 retiree, and this does not include the number of children these working adults have. This would mean that the working class has to work harder which equate to paying higher taxes. An ageing population will also mean a shortage of labour. This will drive up wages since demand for workers in Singapore is more than the supply of workers, resulting in companies in Singapore relocating to other countries with a cheaper and larger workforce. Those currently employed by these companies will likely face being retrenched, increasing unemployment rate. With an older population, more money will be put into savings. This will mean a high proportion of money into retirement plans and less of it available for productive investments – which will lead to slower economic growth. We have already seen a few measures in place by the Singapore government to address the problem of an ageing population. These measures attempt to increase the size of our workforce. Our retirement age currently stands at age 62. However, employers are required to offer re-employment up to age 65 (or a possible age 67 in the years to come) according to the retirement and re-employment act. Japan’s population is ageing faster than any country in the world. In 20 years’ time, Singapore will have face the same demographics as Japan. Unlike Japan, immigrants find it easier to re-situate in Singapore rather than Japan due to the language barrier and culture barrier that Japan has. Hence, immigration is seen to be the best way to ease the impacts of an ageing population. If immigration is a solution to our ageing population, why are Singaporeans unhappy with it? Total Population comprises of Singapore residents and Non-residents. Residents away from Singapore for a continuous period of 12 months or longer have been excluded from the statistics above. According to the statistics, the number of non-residents has increased by a substantial percentage, coupled with a decline in the growth rate of our Resident Population to a low 3.7% over the past 5 years. This rapid rate of influx of foreigners dilutes Singapore’s cultural identity, when foreigners find little need to interact with the locals since they can conveniently find someone from an identical cultural background like themselves. In addition, problems such as high housing prices, rising competition for jobs as a result, adds to even more unhappiness in Singaporeans. 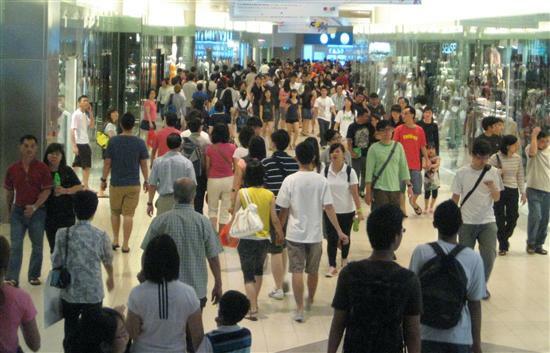 According to the Population White paper, Singapore’s total population is projected to increase to 6.9 million in 2030. With a land area of 718.3 square kilometres, we are looking at a population density of 9,606 people per square kilometre. This is as crowded as cities such as Ho Chi Minh city, and Taipei. We’ve explained why Singaporeans may feel they are being squeezed out in their own country above. Like it or not, we cannot remedy this situation on a national scale individually. Look out for part two of this series, where we will cover some ways Singaporeans can mitigate some of the adverse impacts on their personal lives.